Already receiving support from House Heavyweights Kevin Hedge & Kerri Chandler. Breakthru is a beautifully crafted masterpiece of Garage Bliss. Diva in the making Sacha Williamson teams up with the ESKALATION collective to produce this emotive monster. Andy Roberts adds his own flavor to the mix by stripping down the original elements and arrangement to further add depth to this sweet serenade. 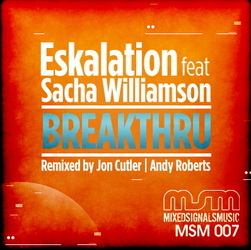 To top it all off, Mixed Signals Music has enlisted the remixing talents of Distant Music front man Jon Cutler to deliver a stunning rendition and dub that captures the timelessness of Sachas’ vocals.